Thank you to everyone who took part in the Green School WOW COW SOW Action Week. We saw huge improvements in the numbers of children walking, and carpooling across all classes. Hopefully this will lead to a continued reduction in traffic on the road around our school. The Greenie Award 2018 were a huge success and we are very pleased to announce the winners…..
Greystones Educate Together N.S. is currently participating in the Green Schools programme. The programme is part of a three way collaboration involving the school, An Taisce and local Authorities. It aims to foster environmental awareness in our school and the wider community. The Green Flag is awarded to schools upon completion of all elements of the programme. We are working towards our fourth flag which is focused will be on travel and transport (Sept 2016- April 2018). Not only have we been notified that we have successfully been awarded our third green flag for water. We have also been announced as the water school of the year in the Eastern Midlands region. We have won a trophy and money for our school towards future green school projects. A huge thank you to the school community for all of the hard work over the last two years. The senior classes created a water drop. 3rd class – 6th class had a guest speaker from Concern in. Laura’s junior infants completed fabulous artwork inspired by water in the lead up to our Action Day. Well done Laura’s class, the paintings are brilliant!! Sixth class completed an experiment to test how much water would be lost due to a leak. They put a small hole in a bottle and held it over a jug for five minutes. They then counted how many millilitres were lost in the five minutes and multiplied it to see how much would be lost in one hour, in one day and in one year. This helped them to see the major impact a small leak can have. Our ‘Action Day’ is taking place on Tuesday the 2nd of February. The committee made some posters to promote awareness of our Action Day. Recently the committee has been undertaking lots of work concerned with saving water and they have generated some great ideas for our upcoming ‘Action Day’. On Tuesday the children will be asked to wear blue, 3rd to 6th classes will be receiving a ‘Cool Water Workshop’ from Concern/Trócaire and each class will be completing numerous water activities in their classes in the different subjects. We will post pictures of the work the children complete after our Action Day. The children have been doing other things in the lead up to our Action Day. They have been completing checks for leaks around the school and have been completing spot checks on any dripping taps. They have been monitoring their water usage at home by completing a ‘water diary’ keeping a record of how many litres of water they use for different purposes each day. These purposes include flushing the toilet, washing hands, showering/bathing, washing clothes, brushing teeth, drinking water, cooking and any other uses. Shower for less time! Taking a 4-minute shower could use an average of 46% less water. By using a shower timer you can monitor time spent there and subsequently reduce the time spent in the shower. Fit a water-saving showerhead, which will reduce the volume of water used by 20% to 30% depending on your water pressure. Think about other ways to re-use water that you would ordinarily pour down the drain. For example, watering plants or even using it for cleaning. It’s worth checking if there are any unfixed or undetected leaks in your home. According to Water Conservation Ireland, you can actually check your water meter before and after a two-hour period when no water is being used. If the meter does not read exactly the same, this means that there is a leak. Avoid flushing the toilet unnecessarily and dispose of tissues and other such waste in the bin rather than down the toilet. Try not to let the water run – brush your teeth while waiting for water to get hot, then wash or shave after filling the basin. Equally wash fruits and vegetables in a pan of water instead of under running tap water. Turn on your dishwasher or washing machine only when they are fully loaded. If it’s less than a full load then adjust the water level according to the size of the load. When looking for a cool glass of water, instead of letting the tap run until it’s cold enough, store drinking water in the refrigerator so it’s always to hand. Kitchen sink disposals require lots of water to operate properly. How about starting a compost pile as an alternate method of disposing of food waste? If washing dishes by hand, fill the sink/basin with soapy water then quickly rinse under a slow-moving stream from the tap. The children on the committee have also been keeping an eye on recycling and saving energy in the school by completing spot checks on the teachers and students recycling and turning off lights and whiteboards at break times. The Green School committee held the Recyclable Christmas Decoration competition again this year and we received the most amazing entries, possibly the best we have ever received! Everyone put such a great effort in so well done to everyone who entered. Unfortunately there could only be one winner chosen from the school to put forward into the Wicklow final. We chose a decoration made by Martha in 5th class. She made a Christmas train and poinsettias out of different bits of cardboard including a Pringles box, toilet roll, cereal boxes, egg cartons, jar lids and ice pop sticks. Martha then went on to win the Wicklow final which is such a fantastic achievement, so well done Martha. She attended the ceremony and received some prizes for her fantastic effort in the competition. We are already looking forward to next year’s competition! Have a look at the winning entry from Martha(first picture) and some other entries from other children. Our noticeboard has lots of interesting and valuable information displayed for the children and teachers to look at. It includes facts about water, water saving tips and also displays of the work completed by the children. The children partook in the ‘Turn it Off’ campaign here in the school. The children were asked to come up with a slogan for saving water and we held a poster competition. The committee decided on the winning slogan which was ‘Save water, save the world!’. 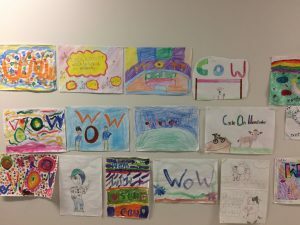 Some examples of the children’s posters can be seen below. Our winning slogan can be seen in the first picture. As well as working towards our water flag we are always revising energy and recycling. 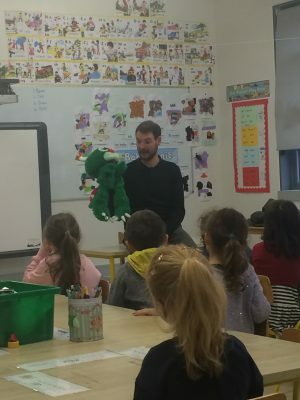 Sustainable Energy Authority of Ireland (SEAI) came in to the three Senior Infant classes to do a workshop on saving energy. They got to participate in activities and meet Guzzler! We have an exciting year ahead in terms of Green Schools. We are aiming to get our third Green flag for the school which is for ‘Water’. We have been working on this for the last year, as well as continuing with looking after recycling and energy in the school. Our excellent committee is made up of children from second class up. They have been working hard to make sure that we are doing our best to save water in the school. There are monitors in each class to ensure that everyone in the class is recycling properly, saving energy in the class and turning off the taps fully. Greystones Educate Together Green School page. ‘Earth Day’ took place on April 22nd and Yvonne’s fourth class completed an assembly based on this. They performed an excellent drama that focused on looking after and protecting our environment. The other classes in the school also completed activities for Earth Day. Some examples of their work can be seen below. This year we are working towards our third green flag, which is for ‘water’. Lots of the classes have been studying ‘water’ in various subjects across the curriculum. The two first classes had a theme of ‘under the sea’ and completed lots of brilliant activities based on water and the sea. Some pictures of their amazing work can be seen below. Fifth class also studied water and the sea in great depths. They were learning about the water cycle. 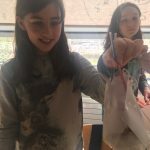 They were also lucky enough to be one of 12 schools chosen to participate in the Explorers ‘Aquarium in the Classroom’ project organised by the Marine Institute of Ireland, the Blackrock Education Centre and the National Sealife Bray. They had to look after and feed two Blennies (Benny & Dots Sembecho), a Rockling (Bubbles), a Starfish (Paddy), three Mussels, a Limpet and an aneome. In September sixth class took part in a beach clean-up down on Greystones beach. Our flag raising ceremony was a great success. We had Ruairí Quinn (our music teacher in the school) playing music on the guitar for all of the children to sing along to. Sixth class wrote and performed a rap song about saving energy. The whole school walked around the yard in the form of a parade, with the green school committee leading the way with the flags. The flags were then raised up onto their poles and everyone was very proud. 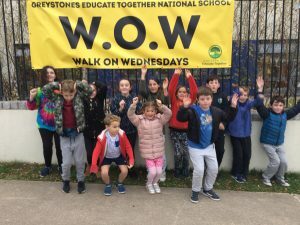 Well done Greystones Educate Together!! We are delighted to announce that we have been awarded the second green flag for our school. A big thank you to everyone who was involved over the past two years. We are looking forward to our flag raising ceremony in the school on Monday 26th May. Greystones Educate Together N.S. is currently participating in the Green Schools programme. The programme is part of a three way collaboration involving the school, An Taisce and local Authorities. It aims to foster environmental awareness in our school and the wider community. The Green Flag is awarded to schools upon completion of all elements of the programme. We are working towards our second flag which is focused will be on Energy. Emma’s Junior Infants made windmills with the help of three parents. Kelly’s Third class made magnetic trails. They even showed the Junior Infant’s how to use them. Check out some of the posters that were displayed around the school to spread awareness of our Energy Action Day. Many people keep their thermostat too high. Check it and if it’s above 20ºC, turn it down. Lowering your thermostat by just 1ºC will knock 10% off your heating bill. Much of the heat loss from a house occurs through the windows, particularly if they are single glazed. So keep your curtains closed at night, even in empty rooms and also ensure that the curtains don’t hang over the radiators, as that will just funnel all your heat out the window. Close room doors to separate heated from unheated areas of your home and minimise the area you are heating. There is no need to spend money heating rooms nobody is in. Turn the lights off when leaving a room. Green School Code The Green school committee asked the children in all of the classes to come up with a special Green School code for ‘saving energy’. The best codes from each class were given to the committee and together they decided on the winning code that they felt would best promote ‘saving energy’ in our school. The code they chose is; ‘The power is in your hands, so don’t waste it’ This code can be seen on the Green School’s notice board. General Update The council have been focused on promoting saving energy in the school. They have visited all of the classes informing the children and teachers of the various ways they can help save energy. Each teacher was given a checklist outlining steps to save energy such as turning off lights and all appliances. The children are responsible for ensuring these things are being implemented within their classroom. Each class has also been given a battery recycling pack, so if anyone has any used batteries at home they can bring them in and recycle them. The council has gained two new members this year- Maddie in fifth class and Amelia in third class. Energy Saving Posters In order to remind people to save energy, fifth class made some lovely posters on energy saving which have been displayed around our school. You can see some examples of these below. Christmas Decoration Competition The Green School committee chose to hold the Christmas decoration competition again after such great success last year. Children were asked to make Christmas decorations using recycled materials. We received some excellent and creative decorations and two winners were chosen to represent our school in the Wicklow County final. The winning entries were made by Amelia and Culann, both in third class. Well done to everyone who submitted an entry! 2012-2013 We are in the first year of a two year process to achieve our second green flag. The focus of the second green flag is Energy. The committee will meet regularly to discuss ideas, plan events, complete an environmental audit and to monitor progress. April 2013: National Spring clean This week the committee will be bringing groups of children from different classes out to pick up rubbish from around the School grounds. All classrooms are going to have a big clean out too. We encourage you to have a big clean up in your homes too! Remember to reduce, reuse and recycle! Sustainable Energy Authority of Ireland visit to our School. Recently a representative from the Sustainable Energy Authority of Ireland came in to do Energy workshops with six of our classes. Each class learnt a lot and had great fun participating in the experiments. The Junior classes loved meeting Guzzler! We completed an environmental audit of the school. We have noted all the appliances in the school that use energy and we are in the process of monitoring and recording the temperature in each room in the school twice a day. If any relative is working in the energy sector and would be interested in coming in to the school to talk to the children please let us know. The Green School Committee 2012-2013: The Green School Committee 2012-2013 consists of teachers, children, parents and the caretaker. The children representing each class are as follows: 1st Class: Cerys and Charlie 2nd Class:Amelia and Danny 3rd Class:Mirra and Zephan 4th Class: James and Poppy 5th / 6th Class:Peter and Mia. May 2012: Fantastic news! We have been awarded our first green flag. Congratulations to all the students and staff in the school who worked really hard to achieve this. We will get our Green Flag in May 2012. Louise took over the Green Schools this year and we formed a committee at the beginning of the year. Our committee has one child from each class and our caretaker Ben. We meet regularly to discuss our Green Schools progress and work, and plan events. We continued on the hard work done last year and did an environmental review to see where the litter was in the school. Second class participated in the Environmental Review on behalf of the Committee. Working in pairs, the children had a map and a pencil; and one camera between the group. The children walked around all the school grounds and noted any litter found on their maps. 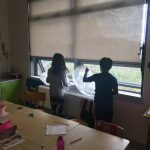 The children noted that there was more litter around the outskirts of the playground, and the hilly grass area behind the school needed particular attention. We did a Green Day of Action on Thursday November 17th 2011. We chose this day as we knew that the Green Schools organisation were celebrating ‘Give a Tree Roots Day’ on this day and planting a trees to celebrate all the schools participating in Green Schools. We had a really busy day! 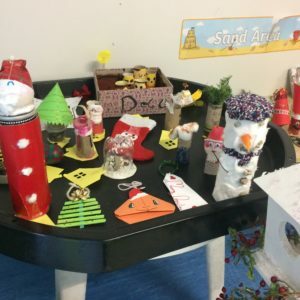 Recycled art – most classes made musical instruments using recycled materials, third class made cars/tanks/trucks with recycled materials, second class made robots with recycled materials and made butterflies with pencil sharpenings. All children were invited to make Christmas decorations out of recycled materials. Don’t be mean, keep the world clean! The code is now displayed on our Green notice board. Well done Ryan! Our Green Schools Committee was established at the beginning of the year. This committee includes teachers, pupils, parents and the caretaker and meetings are held on a regular basis. Our green school board is in the main entrance of the school and parents and pupils can keep up to date on upcoming events and activities in progress here. We began by examining the impact of litter and waste in our school, by going on a school walkabout with a camera, recording areas of the school grounds where litter was a particular problem. We examined classrooms during the day and found that these could be tidier than what they are. We also noted the types of waste being produced in class and came up with practical ideas for reducing and minimizing the amount of litter and waste produced by the school. We then formulated our action plan. This is revised on a regular basis. A pencil toppings tin for each classroom. Orange bag in each classroom for paper. Black flowerpot in each classroom for food skins. General waste in lunchoxes is to be brought home. Daily tidy classroom competition with tidy classrooms getting a happy face and untidy classrooms an unhappy face. We have decided to hold a Spring Clean both inside and outside the school to clean the school grounds. This will be in accordance with ‘An Taisce’ and will take place in April. During specific months we will target the recycling of various objects e.g. stamps, mobile phones, batteries etc. The pupils on the Committee inform pupils of the Green schools Message. Aim: Through these actions we hope to cut down on the waste being produced by the school and increase the amount going into the compost bin. To view the seven step process of how a green flag is obtained click on the following link: 7 Steps. For more information, games, posters and stories that are all child friendly and environmentally related click here. If you would like to become a member of our Green School team or simply want to pass on your ideas, you are more than welcome and you too can help us make this school and the world a greener place. They also had the task of designing and colouring a green school mascot that would represent the school. As well as this they had to state why their mascot deserved to be chosen. I would like to congratulate Sam Leahy on his winning entry. Our compost bin is filling nicely and we now have a bin located next to it for all of our dry recyclables as we step up the process of recycling our waste.